The Scorpions Metrowest Region is based out of Medway, MA and provides yearlong training opportunities for players between the ages of 4 - 18. Our Metrowest Region is continously growing and is home to hundreds of players each year who are actively competing in the New England Premiership. The Scorpions East Region is based out of Braintree, MA and provides yearlong training opportunities for players between the ages of 4 - 18. The East Region is home to hundreds of players each year who are actively competing in the New England Premiership. The Scorpions South Region is based out of Taunton, MA and provides yearlong training opportunities for players between the ages of 4 - 18. The East Region is home to hundreds of players each year who are actively competing in the New England Premiership. 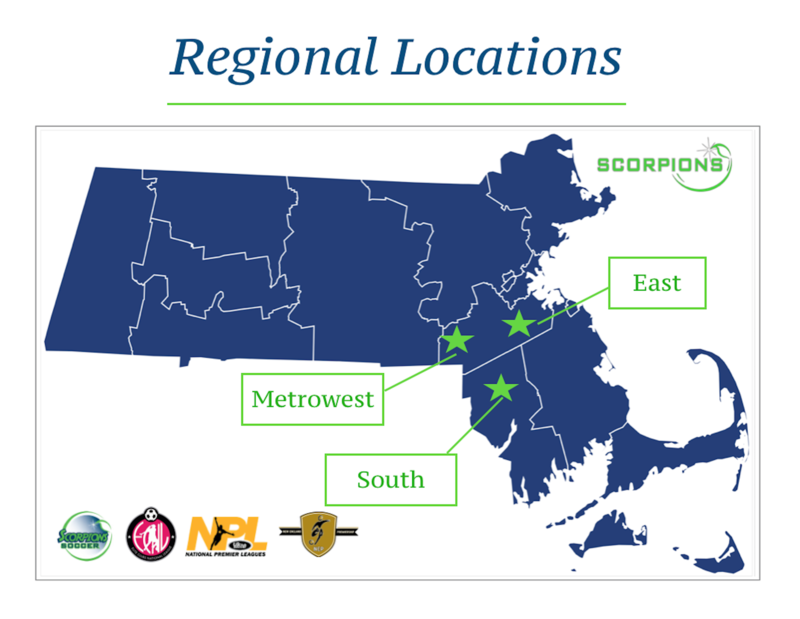 All Scorpion Regional Teams compete in the New England Premiership (NEP). The NEP is a new Club-based league for clubs throughout New England focused on player development. The NEP will create a superior player development environment by ensuring the appropriate numbers-a-side per age group - U9's and U10's will be 7v7, U-11’s and U12’s will be 9v9, U13’s and U14’s will be 11v11. The League will also work to acquire the highest quality of referees (the NEP is also looking to add a referee mentoring program) and establishing superior dialogue between club officials and referees to develop this side of the game. The New England Championship (NEC) is a standards based league focused on player development and game day environment while providing teams and clubs a pathway into the NEP.